The strangest thing has just happened, and I don't really know what to make of it so I thought I'd write some words to see if I came to any conclusions. I've just kind of accidentally been on a deer hunt in the woods. I was sitting in the shed writing a fascinating blog post about carpets while Dawn was up at the house making tea (spag bol, if you're interested), when on the CCTV I saw a 4x4 pull up next to the house and the driver approach the front door. Despite being vaguely aware that burglars tend not to knock these days I pulled my jeans on and sprang in to action, reaching him just as Dawn was opening the door. Now, with The Lodge being right on the edge of a large area of managed woodland we already know that shooting goes on around and about and that this comes under the general catch-all umbrella term of The Shoot - pheasants, foxes, trespassers... that kind of thing. 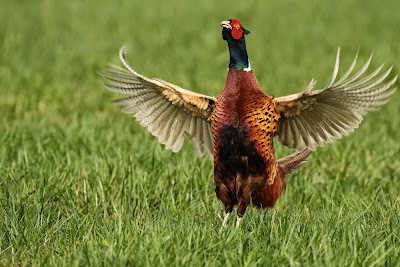 Our visitor introduced himself as being part of The Shoot and, very kindly, he was showing a little bit of courtesy by letting us know that he was parking next to our house (not on our land, so strictly-speaking he didn't have to say anything) while he headed off to hunt Muntjac deer. 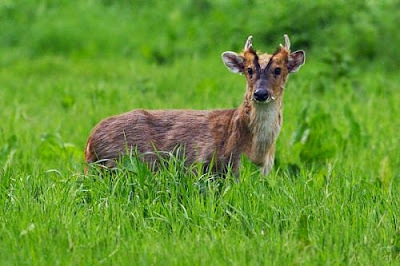 If you've read our post about the local wildlife you'll remember that we've heard Muntjac in the woods at night - twice now - and we were really quite excited by it. So it was with mixed feelings that someone was on our doorstep announcing that he wanted to blow ones brains out. And not even for the meat - just for sport. I asked. Nevertheless we had a polite chat about stuff, during which time I asked him not to shoot SausageTheCat. I even described him as being black-and-white and cat-looking. I needed to be sure that he was fully aware, you see. I stopped short at showing him a photo on my phone, though. Anyway, he said he'd be careful and that's all we can ask for. I then, on a complete whim, asked if I could join him. I don't know where the question even came from. And this is where the puzzlement comes in. I like to think that most of the time I'm a pretty level-headed and realistic person, so despite having lived all my life in towns and built-up areas I'm fully aware that people hunt for various reasons. I'm quite pragmatic about it. 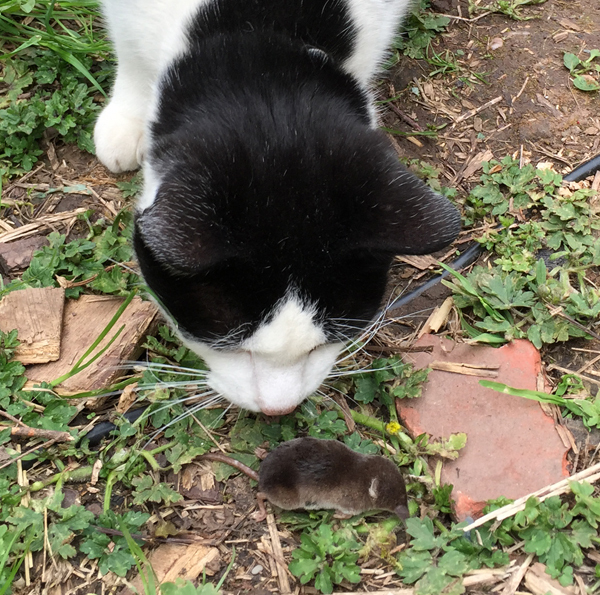 But unless said hunting is done humanely and for a reason that I agree with, such as vermin control or for food, I can't say that I'm a big fan of it. Like hunting foxes with packs of dogs because it's 'fun'. No. Just, no. Yet I saw an opportunity to see a little bit of real country life, so I asked the question. And he said I was welcome. And I went. I spent the next 20-25 minutes following a rifle-carrying total stranger through the deep, dark woods, trying not to make noise in an environment that was made entirely out of sticks. 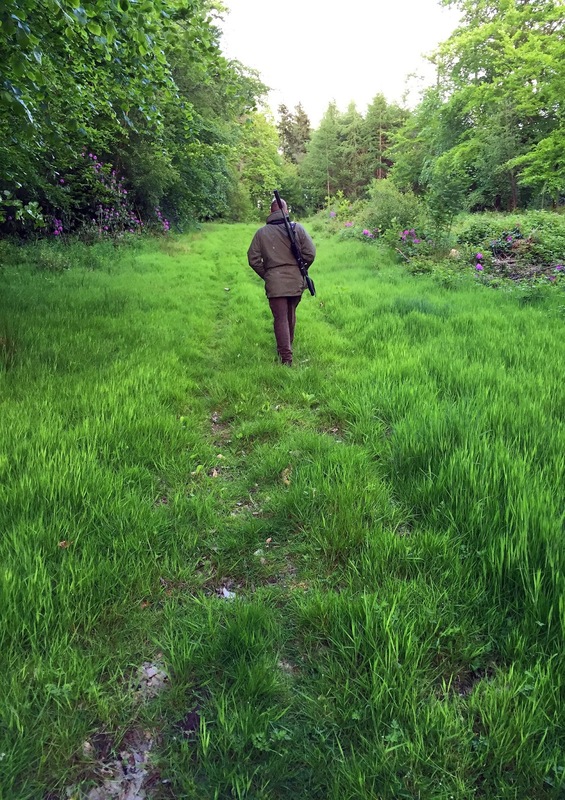 We didn't speak much, but he showed me a few deer tracks and he pointed into the trees as I heard the sound of what was, apparently, the disappearing arse end of a roe deer that had been lying under a bush just passing the time of day. Like an Indian tracker he even had a feel of the ground to see if it was still warm although, disappointingly, he decided against tasting its poo to test the freshness. He then told me that he was going to stand under a tree wearing a green camouflaged veil for the next hour or so and although I was welcome to join him I decided to head back... grateful that he hadn't seen anything that he was able to kill while I was with him. Nevertheless, at Dawn's earlier request he promised to give us a knock if he did bag anything, so I'm watching the CCTV monitor as I type, waiting to see him dragging a bloody carcass across our garden, wearing its head as a hat. Which would be quite disturbing, I have to say. So having typed all of this, have I sorted out my feelings about it yet? And I'm not sure I will either. It takes a bit of an effort to psych myself up for a job in which I know I'll get filthy and horrible, but I returned to Bedroom 1 today to finish off revealing the fireplace that I started last week. In the first round of destruction I had managed to reveal a bit of a mystery, in that behind the wooden frame which had been holding up the papered-over fibreboard cover there was some kind of brick set-up which appeared to have a firey purpose, although I couldn't figure out what it was. Looking up the flue suggested that no actual burning of note had ever taken place in there either so I hoped that today I could finally work it out. Nevertheless, out came my trusty lump hammer and bolster chisel and once I had removed most of the frame (some of it was attached to the brickwork with 3" nails) I started carefully tapping away at the bricks which didn't appear to be original or tied in with anything else. It took me almost a week to put this together. Jigsaws just aren't my thing. Most were only very loosely mortared in place and many of those I could remove just by pulling them out, whereas some took a little bit more effort. Not much, mind. Interestingly most, if not all, of the mortar was lime mixed with horse hair as a binding ingredient which tells me that it was done some considerable time earlier than the 1957 News of the World I had found in there last week suggested, because at that time ordinary cement mortar would likely have been used instead. It also explains why they were so easy to remove because the lime would have become weaker with age. This ties in with the fact that the bricks I pulled out were a mix of soft and crumbly orange Victorian ones and harder more (comparatively) modern ones, which suggests that both were readily available at the time and maybe the softer ones were just being used up to get rid of them. I'm guessing of course, and I'm not exactly an architectural Columbo, so it's entirely possible that I'm way wide of the mark. Nevertheless I still like my theory - old but not original. Anyway, to cut to the chase, I eventually revealed a straight-sided fire chamber not unlike the one I uncovered in Bedroom 3 last week: reasonably small and narrow with an arch above it and a quarry tile base. Despite having been covered in gypsum again - like in Bedroom 3 - the arch was in much better condition with considerably less spalling (crumbly bits)... but it wasn't very 'archy'. I'm sure the thought was there when it was built though. So points for that. The first bit of major building work starts in a few days when the eastern chimney stack will be partially rebuilt, flue liners will be dropped for future log burners and sections of the roof repaired. Now it doesn't take a rocket surgeon to work out that the flues in both the eastern and western stacks will have never seen a liner or a brush in their 150-or-so years, and the chances were that they'd be gopping with soot, salts and other nasty materials that over time would probably want to leach out into the house through the brickwork - if they're not already. 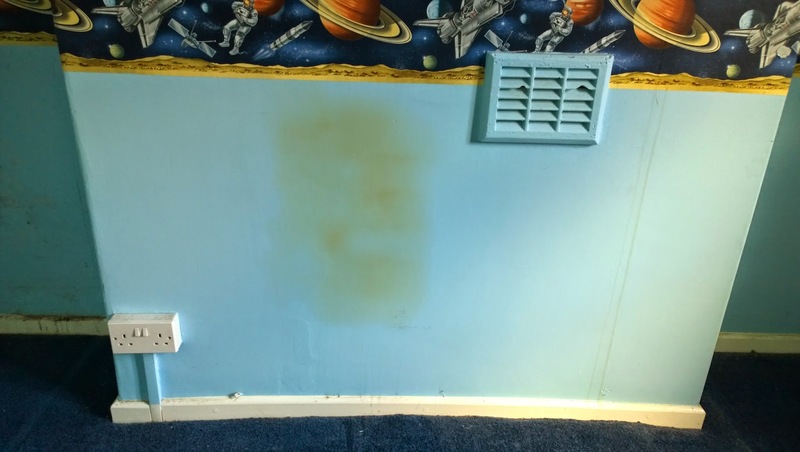 In fact before we stripped the wallpaper in the Blue Bedroom (Bedroom 3) there was already some icky brown staining evident on the chimney breast, so that had roused our suspicions from the off. Also, if we've learned anything from our friends at Renovating an Old Stone Cottage, it's that chimney salts can be hygroscopic and actually draw moisture out of thin air and send it into the brickwork, thereby adding to the damp and humidity in the property. So in preparation for the building work we booked a chimney sweep, who came yesterday. And in preparation for his arrival, I destroyed stuff for a couple of days before that. The Living Room already has a circa 1970s open fire and the Dining Room has a tired old Coalbrookdale Little Wenlock log burner that feeds through a register plate into the chimney, so Mr Sweep was sorted in terms of access to the flues downstairs, but Bedroom 1 and Bedroom 3 have had their old fireplaces covered up and they needed to be uncovered to see what delights were hidden within. So armed with goggles, gloves, a respirator and Man Trousers, I jumped straight in and prepared to jump straight back out again if I saw a spider. The fireplace here had been hidden using cheap fibreboard which had subsequently been wallpapered and painted over. The passage of time had seen the outline of the board become visible through the surface of the paper so with the help of a Stanley knife and lots of manly grunting I pulled the board away in bits to reveal the cobwebby delights of an ancient pigeon graveyard that was partially buried in what looked like soil, but what I later learnt was probably petrified nests that were so old they had crumbled in to dirt. Construction-wise the fireplace opening was fronted by a cobbled-together non-structural wooden frame, presumably to stop the fibreboard sagging in to the space behind it. If the board had been attached originally then it wasn't any longer. Behind that were four or five courses of bricks that had been chucked in and loosely mortared in place on either side, across the centre of which was a narrow metal grate of some kind that hadn't been inserted with any degree of enthusiasm and wobbled about a bit. Directly above the grate thing were a series of bricks that sloped up and away from the opening towards the back of the firebox. Not being accustomed to the anatomy of a fireplace I'm yet to work out what this was intended to do. It's a little bit like an inverted throat damper, at the top/back of which was a hole the size of a tennis ball that fed down behind everything to the ash dump below at floor level. The ash dump itself had quarry tiles at its base. On either side of the sloping brick thing were black(ened?) bricks sitting directly above the lower bodged courses, but set back from them a little. Again I'm yet to work these out, but if they're original then we'll hopefully be keeping those and incorporating them in to whatever we do with the fireplace in the future. The lintel was just a flat iron bar that seemed to be supporting everything above it pretty happily, which is a relief. Here's a tip: If you decide to board up or otherwise cover anything that future owners of your home might want to unearth, stick a current newspaper in there so the work can be dated. News of the World, August 11, 1957. Beryl Fray, 21, from Tiverton. The saucy minx. That's exactly what the person who did this work decided to do on August 11, 1957, when he stuffed a bunched-up copy of the News of the World in a recess at the back of the ash dump. It's fascinating to know a little bit of precise history and saves me pondering how old the pigeon skeletons were. Some of them are likely to have died there when the people who were to eventually become my parents were still at school! Here, things were slightly different. A vent had been stuck on the chimney breast wall, off-set to the right, and no amount of tapping on the gypsum plaster would reveal if there was even a former fireplace there at all. The noise was consistent all the way around the chimney breast and up to where I already knew it was solid. Knocking the vent off revealed a letterbox-shaped opening that, again, was chock-full of 'soil' and the breastbone of an unidentified feathered friend. As this was obviously a young boy's bedroom for the previous occupants, it couldn't have been a terribly healthy set-up. The narrow hole had a solid-feeling cement base to it and bricks on either side which at first made me think that any fire that may have once been there was a standalone stove that stood on a cheap concrete hearth that I found underneath the carpet and vented up the chimney through the opening. Where the hole turned to head up the flue that, too, was packed solid with dirt. With exploration in mind and using a hammer and bolster chisel I started carefully chipping away at the gypsum plaster around the hole, and discovered two different types of brick. Down and to the left of the opening I found seemingly original orange brickwork that was beginning to crumble because of the moisture-retaining properties of the plaster that had been slopped on top of it - along with painted wallpaper as a covering just to make things worse. But directly beneath the hole were more modern, more dense bricks. It quickly became apparent that there was indeed an old fireplace lurking here, but unlike that in Bedroom 1, the whole thing had been bricked-up, leaving just a small opening for the chimney to breathe... which it would have stopped doing once the first doomed pigeon took a nosedive down the uncapped flue. Another couple of hours of careful chipping revealed a narrow fireplace topped with a lovely brick arch which, again, was crumbling because of the plaster that had been laid directly on top. We might be able to save it somehow when it comes to reinstating the whole feature, but we'll have to see how it goes. And once again the lintel was just a simple flat iron bar that seemed to be in the same reasonable shape as the previous one. Of course by 'reasonable' I mean 'not in danger of imminent collapse'. Knocking the first two or three courses out from underneath the opening so the chimney sweep could get access revealed evidence of a rubble-and-loose-concrete-filled void beneath what I had originally thought was a cement slab of sorts at the base of the vent hole. 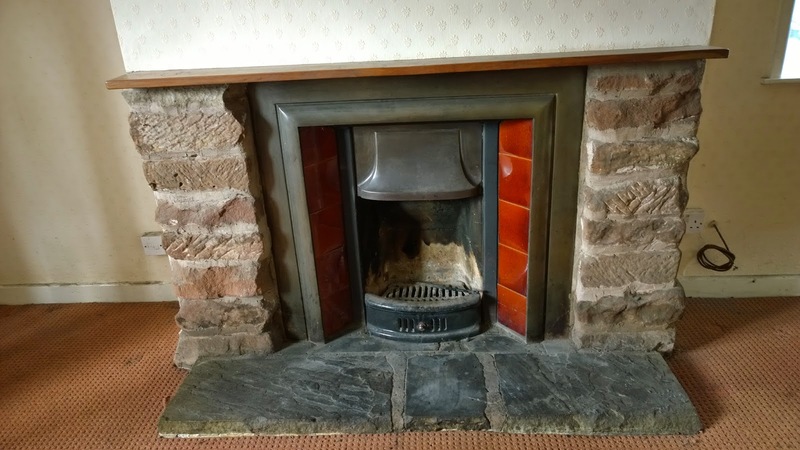 Once Mr Sweep had been and gone I continued knocking bricks out to the point where I revealed an open fireplace devoid of any structural or original brickwork with, once again, quarry tiles forming the base of the feature. The arrival of the chimney sweep was heralded with a mug of coffee and a quick tour of The Lodge, and he decided that the flue in Bedroom 1 was indeed sparkly clean and didn't really need sweeping out. The only thing sweeping would have done, he said, would be to remove some of the lime pointing from the brickwork that had deteriorated and loosened over time (lime mortar is a sacrificial building element and will do that over the years) and it was more use left in place than filling a plastic bag in the courtyard. 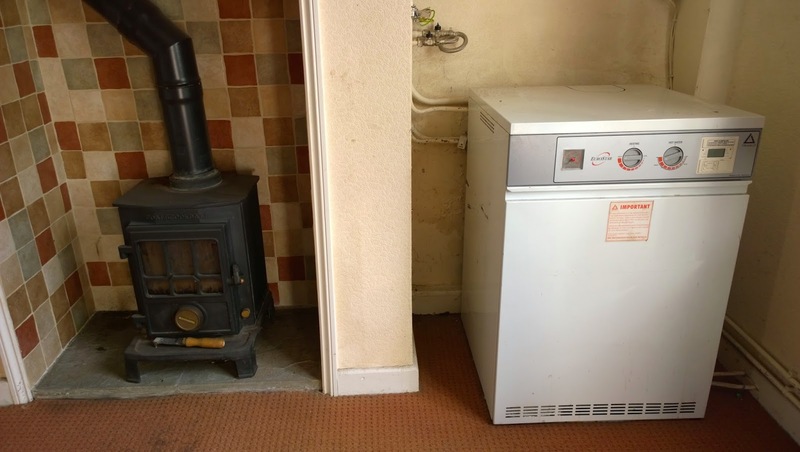 Overall he spent about five hours at the house drinking coffee, having a good old natter and occasionally sweeping flues, and one of the main things he discovered was that at some point in time the flue from the Living Room had been on fire. This is a major development for two reasons. First of all it could explain why the upper half of the western chimney stack has been rebuilt at some unknown point in time - the devastatingly fierce heat could have destroyed some of the brickwork - and it could (but certainly not definitely) explain why there's a crack running up through some of the sandstone blocks on the external wall in the direction of the chimney stack. It's not a crack we're particularly worried about but it's nice to have some clues about its potential origin. So that's about it. The upshot of all this is that we now have two new old fireplaces to get our thinking caps on about, a log burner out in the courtyard for me to attempt to renovate at some stage, a bunch of bags of chimney fodder outside, four clean flues and a lot less coffee than we started out with. Where we used to live, the term 'wildlife' used to comprise the occasional urban fox, guerrilla gangs of starlings, the odd bounding grey squirrel and scrap men with their flatbeds and loudhailers. I'd always had a soft spot for the animal kingdom but hadn't really been exposed to much on a day-to-day basis. But now, on the edge of the woods, it has hit a whole new level entirely. Like a five-year-old at Christmas I'm finding myself constantly fascinated by all the shiny new things to discover. 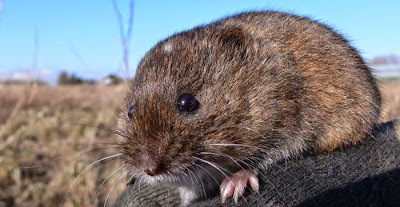 Voles. You don't see many of them around under normal circumstances - in fact you're more likely to see mice scampering up the garden wall once in a blue moon, but SausageTheCat seems to have an eye for them. Or at least he did before he decimated the population in the immediate area. After six merciless kills that we know of he hasn't brought a tiny twitching corpse back for about two weeks now. That's not such a bad thing, considering, but still. So it's possible that the local owl population is going a bit hungry. We've heard from a few people that barn owls are nesting a short walk away through the trees but we're yet to see or hear any. 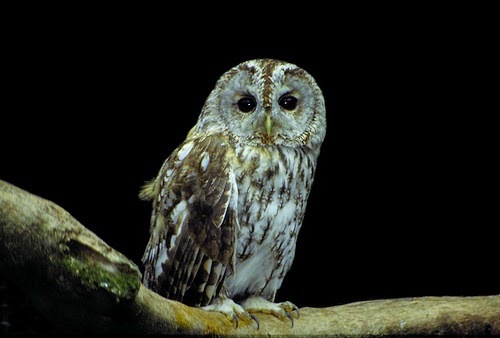 What we have heard, however, are tawny owls, a pair of which seem to be nesting very close to the house. Most nights we hear them calling to one another over a short distance, which in the dead silence of night can be surprisingly loud. In fact 10 minutes before typing this there appears to have been an extremely vociferous argument in the owl community between at least four of them, spread over a small area, although it seems to have gone quiet now. Maybe they're in the huff with each other. One genuinely sounded a little bit breathy and hoarse - I'll keep an ear open for him again. A week or two ago I stood mesmerised outside just listening to one of their more regular chats and staring at the darkening sky when one swooped from across the road and passed about 10ft straight over my head to land in a nearby tree. Seriously, I almost cried. It was amazing. With The Lodge being a former gamekeeper's residence it's not surprising to learn that there are quite a lot of pheasants kicking around too. They can usually be heard shouting in the trees in a harsh voice that sounds like metal scraping against metal, but we often see them wandering around right outside the house, looking for the nearest road so they can hurl themselves at the passing traffic, such is their habit. Stupid, stupid birds. They're the Joey Essex of the animal kingdom. Incidentally - and here's a confession - I had to shoot one in the head the other day. Dawn and I were on the way home from a friend's house and I just happened to have my air rifle in the car. A few cars in front a female pheasant who was passing the time of day by casually pacing the Tarmac got clipped and spun off in to the grass, obviously badly injured but very much still alive. So I pulled over, got the rifle out and... well, it wasn't my cheeriest moment ever but it was necessary under the circumstances. And no, I didn't take it home for tea. I've got no idea what to do with one. 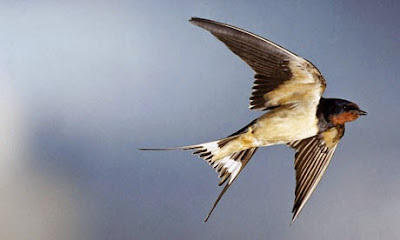 Still on the subject of birds, of which there are hundreds of varieties around the property, we have a couple of swallows nesting in the eaves of the house. Cute little things, they're often causing a tweety commotion somewhere within immediate earshot and can usually be seen zipping around over the house or sitting on the roof, eyeing us with curiosity before one nips in to the nest then straight back out again while the other keeps watch. We've named them Nemo and Dory. Nemo has one pointy streamer missing off his tail. One bird that people we've spoken to seem to be totally giddy about is a local cuckoo. "He's back, have you heard him?" is the question we've been asked a few times now and there'd been no sign of him until a week or so ago when he started yelling at the shed. 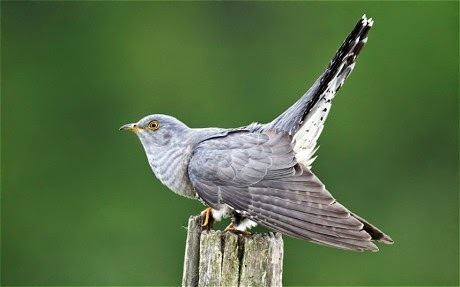 A quick Googlage tells me that cuckoos are on the endangered Red List, so it's no surprise that folks are excited by it. I'm looking forward to seeing his missus kicking the eggs out of other birds' nests so she can lay her own. Nature, eh? Delightful. I don't know much about bats, but they're pretty bold around The Lodge. Last night I was reheating left-over curry in the microwave (Dawn was at a work do and I'm a bloke, so it's mandatory) and was stood in the courtyard waiting for the ping while watching the bats swoop down to eye level right around me. It was fascinating. They were so close that I could hear their tiny little wings slapping about. Again, I almost cried. I've used a photo of a Common Pipistrelle here because... well, they're common, but to be honest they could be cricket bats for all I know about them. Finally for now, although we're yet to see foxes or badgers (plenty of grey squirrels, though), we'd heard what we'd considered to be a local urban myth about Muntjac deer in the area. Nobody we've spoken to has seen one and they'd only heard unconfirmed rumours about their possible-but-unlikely presence, and there are no warning signs on the road outside, so we weren't expecting much on that front. Until, a few nights ago, one started barking its head off very close to where we were sleeping in the shed. For a good 10 minutes at that. So long in fact that I had the presence of mind to find my phone and record it - listen below. Let me tell you that when you're not expecting it and there's nothing but silence at 11.30pm under a clear starry sky, a deer having a sudden sing-song at the top of its lungs doesn't do a lot for the heart, especially when you don't know what it is. But now that we've Googled and listened again it's the most exciting bit of wildlife news we've had so far and we can't wait to hear it again. We might even nip out with a torch, but the chances of us seeing it are slim at best. One thing we could do is ask the fella who owns the shooting rights on the estate but we're worried he'll dig out his bazooka and blow it to bits. Oh, and spiders. I don't do spiders. 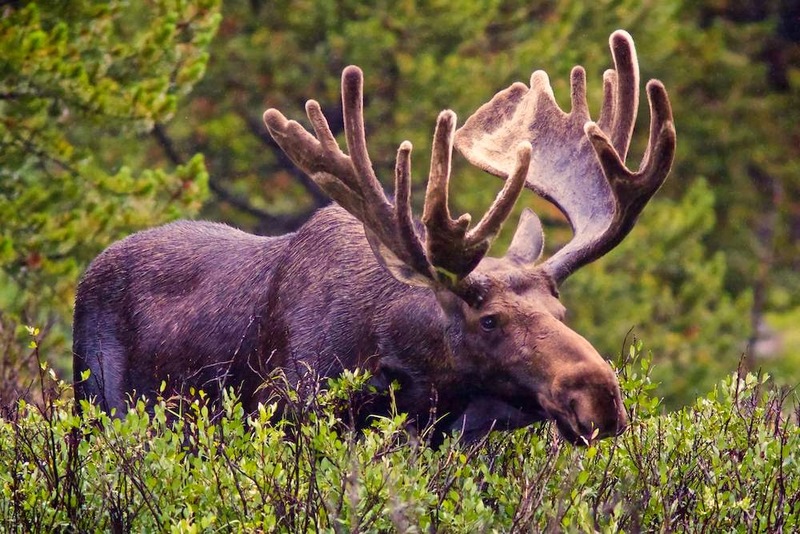 They're so big here that they've probably eaten most of the deer. And moose. There's a suspicious lack of those too. A little while ago, during a lull in the workshop/shed-building process when curiosity got the better of us, we sent a video camera down the well on a rope. Yes, it was important to get the shed habitable – because the house isn’t and we needed somewhere to sleep – but there are other matters that are equally important, especially to big kids like us (Andy was helping too, and he brought extra rope). Are there monsters down there? Skelingtons? How deep is it really? How deep is the water at the bottom? Why does the well blow a steady flow of air through the cap some days but not other days? Could we convert it in to a ridiculously-flamboyant wine cellar? So with the help of zip ties, gaffa tape, a couple of 12-hour glowsticks, a torch or two, a Drift HD sports video camera and a couple of waterproof Aquapac bags, we spent much longer than we planned getting this footage. I’ve stopped it at the water because nothing much happens after that (other than absolute darkness), which is a bit frustrating because the camera either got stuck, floated or the water isn’t as deep as I thought and it settled at the bottom quickly. When we eventually brought the rope up it was tangled quite badly towards the camera end which suggests that we were just feeding it on top of itself after a while, but nevertheless, and after my initial solo unscientific depth test a few days earlier, we reckon it’s somewhere between 150ft and 200ft to the surface of the water which, from what I’ve been reading, is very unusual because most Victorian wells were only about 30ft maximum depth because that’s all the common iron pumps could deal with. Former gamekeeper George popped by again a few days ago and, without wanting to raise suspicion (it didn’t come up on the legal searches, so the more secret the better), we casually asked if there just happened to be a well on the property. He said there was “over there somewhere”, it was a 140-footer, and he’d had the pump beautifully restored many years ago only for his successor to scrap it without a second thought. Anyway, here’s the video. We fed the rope quite slowly because we were chatting, drinking tea and getting it stuck now and then, so I’ve speeded it up a bit. Enjoy. To make sure our fifth wedding anniversary would be a memorable one today, yesterday we were unburgled. "Unburgled?" I hear you say. "Shirley you mean burgled..."
In the very early hours of Thursday morning I thought I heard a car door shut and a vehicle drive away. That's not illegal, and there's a parking spot nearby on the public side of the wall, but it got me a bit paranoid so I broke out the CCTV system I'd been meaning to get set up. For some reason our priorities had been elsewhere and that had taken a back seat. In retrospect we'd taken our eye off the security ball completely and got a little too complacent too quickly. So I thought I'd kill two birds with one stone by setting it up from the shed where we're sleeping and pointing it at the house where we could also keep an eye on deliveries without having to jump up and run outside whenever we heard a random vehicle during the day. With that in mind I only set two cameras up - one pointing directly at the front of the house and the other looking along the side of the property to capture anything that parked out of view of the first. Cam 1 had a decent view/picture but the other was further back so wasn't as useful but would still let us know if anything was there. Yesterday morning, Saturday, Dawn and I went out to do various things such as look at log burners, go to B&Q and stuff like that. We left at 10.30am and got back at about 5.30pm. A nice day was had by all. A few minutes after returning I was brushing the cat round the back by the garage when I noticed the garage doors were open a little bit. Which was when I found the padlock hasp hanging partially off and the fixing screws all bent. There was also a footprint left on the door from where someone had got leverage. We had a good look around - the cover was off a motorbike we keep in there but that was it. Nothing else was missing from the garage, our power tools were still in the unlocked outbuildings and there was no sign of a break-in around the house itself. But why was the hasp still kind of attached to the garage door? It was a huge head-scratcher. We called the police on 101 and waited. Sian, our friendly PCSO, turned up with a colleague and called forensics for the footprint, and he turned up a while later, dusted for prints, took an impression of the footprint and left. I haven't uploaded footage from the second camera because it's a bit ropey, being so far away, but essentially they go in to the courtyard, take boxes of power tools and load them in to the boot of the car. When they spot the CCTV camera they bring the car back around, put all the tools back where they found them and try to cover their tracks by pushing the padlock and hasp back in to place. They unburgle us. Thoughtful scumbags. Needless to say last night was sleepless (for me - Dawn was also very concerned but nothing keeps her from her beauty sleep) because I was worried they would come back to get the footage off the CCTV hard drive. They had obviously seen the shed, which was when they saw the camera, and I was concerned. So I lay in bed with my clothes on and a big metal bar on the floor, ready to break legs. Today I'm buying a cricket bat, but only because I haven't got a shotgun licence. We have had a professional HD CCTV system installed that will not only (literally) pick out a car registration plate perfectly at half a mile but - with a few tweaks - will shoot dead anyone who looks even slightly shifty within 10 metres of the property. We have also put up a truly massive bright yellow CCTV warning sign at the main gate, which means that anyone who misses it really shouldn't be allowed outdoors without supervision and they certainly shouldn't be anywhere near the drivers' seat of a car. It was an unexpected four-figure expense, but an absolutely essential one that gave us pretty good peace of mind as soon as those beautifully pin-sharp cameras were switched on.